It might sound crazy, but I learned a lot when I went on a Pescetarian diet for a month. First of all, I became much more interested in exactly why people wanted to be vegetarian/vegan. Is there really that much wrong with the meat we all eat? So, I watched quite a few documentaries and read many articles that told me that yes, much of the meat we mindlessly buy day in and day out is pumped with artificial colors and hormones. Some companies keep the animals in extremely unsanitary conditions, inject them with chemical cocktails containing goodness knows what, and don’t feed them the foods they were naturally meant to eat. That’s just not fair to them or to us. Of course, I know that there are some companies out there that are very humane to both their customers and their animals, but I also know that, for the most part, the meats that I was buying were not from those companies. I don’t want this post to turn into a PSA, I’m just simply sharing what I found out through my not-so-extensive research. If that sort of thing doesn’t bother people, that is completely fine with me – I’m all for people eating what they want! Those two findings inspired me to recreate a family favorite recipe: chicken enchiladas. My mom found a recipe online a few years ago, and since then we have made it quite frequently and loved it. It’s so simple and filling and oh my gosh delicious. To make it vegetarian, I took a cue from some of my favorite store-bought burritos and decided to replace the chicken in our favorite recipe with beans. Oh my gosh were they amazing. A few of my friends, who were over for lunch, were the taste testers for the recipe. When we were done, Amber brought up a great point. She said that she noticed after eating meals that did not contain meat that she didn’t feel as groggy. She felt full, she said, but in a more clean way. I thought that was the perfect explanation of how I felt the whole month that I was on a Pescetarian diet, and how I feel whenever I eat vegetarian meals. In a large bowl, beat softened cream cheese and Greek yogurt together. Stir in 1/2 cup of the enchilada sauce and 1 cup of the shredded cheese. Stir in the corn, cumin, oregano, cayenne, salt, and pepper. Fold in the beans, taking care not to squish them. Stir in the spinach, if using. Spread 1/2 cup enchilada sauce over the bottom of a 9×13-inch baking pan. Place about 1/3 cup of the filling into a tortilla and wrap. Place each enchilada seam-side down into the baking pan. Repeat until the pan is full. 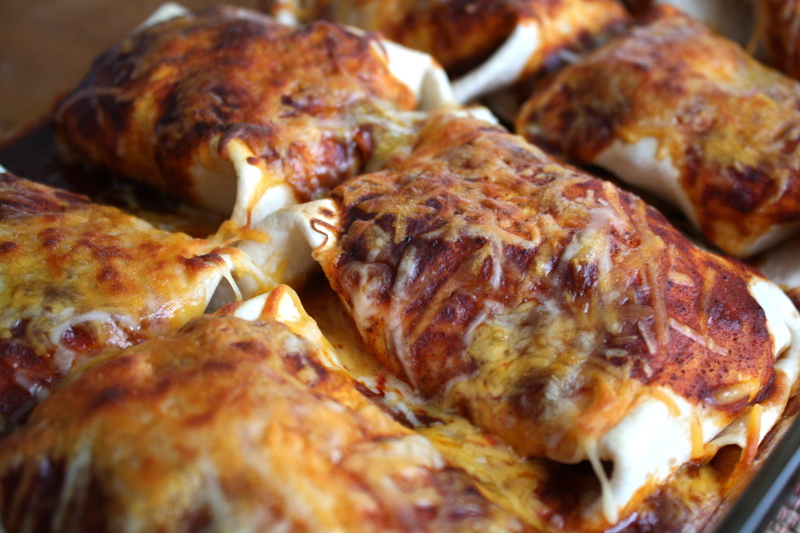 Top the enchiladas with the remaining enchilada sauce, and sprinkle the remaining shredded cheese over top. Bake for 20-25 minutes, or until the cheese is bubbly and golden brown. Stir in flour and chili powder, and cook for about 1 minute, stirring constantly. Bring to a boil, then reduce heat and simmer for about 10 minutes. – Instead of the pinto beans, add: 2 cups diced baked tofu or 2 cups diced cooked chicken. I decided to link this post up to Healthy Diva Life‘s Marvelous in my Monday! Those enchiladas look completely fabulous! I love that you made your own enchilada sauce too! Thank you! It’s really very easy…and none of the scary additives in store-bought sauce! Yum! Those look and sound delicious! We love enchiladas but I haven’t made them in so long! Glad you joined in! Thank you! Me too! 🙂 Thanks for hosting! These look delicious! I’m all for reducing our meat intake, even if we never make the switch to total vegetarians. Exactly! Why not, you know? 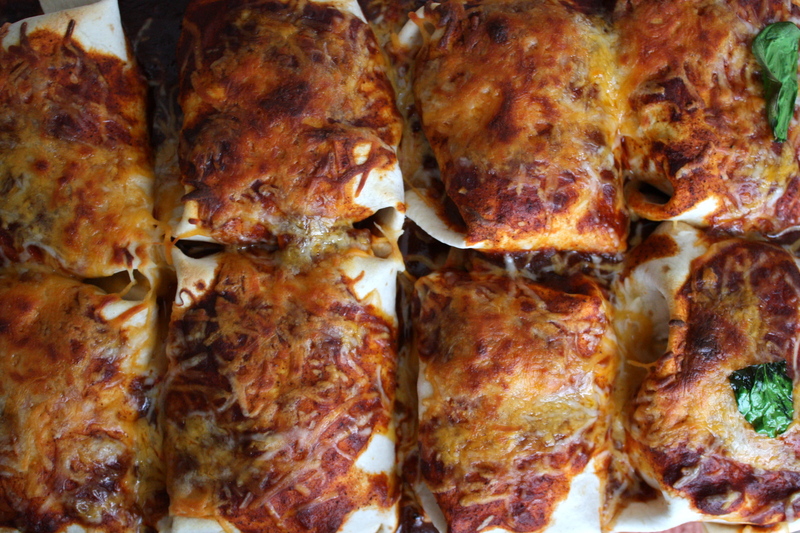 Have made these enchiladas on two separate occasions and both times they have been a hit! It is a simple recipe that makes for a great leftover the next day! Keep the recipes coming! I am a big fan! Yay! I’m so glad you liked them! And the leftovers are just amazing… 😉 Thank you! Wow! I would eat meat free every single day with those enchiladas 😉 Yum! Haha thanks! I think I would too!